The slaughter industry is characterized by big abattoirs, high slaughter speeds and long transport times. 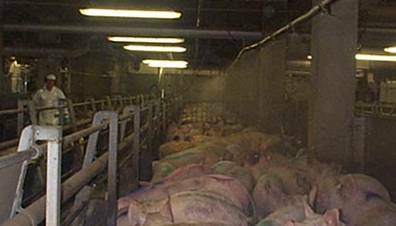 Normally pigs are driven from farm to abattoir several hours before slaughter and about half of all pigs are lairaged overnight. Pigs are mixed in order to keep the variation in liveweight small. In an intact litter of pigs the difference in slaughter weight between the heaviest and the lightest pig is about 30 kg and because of that pigs from the same litter are seldom delivered at the same time. The chosen stunning method determines the system for driving pigs to stunning. Gas stunning is conducive to humane handling if non-aversive gas mixtures are used. There is still a lack of knowledge about the mechanisms of brain function during application of electrical currents to the head. Handling pigs in groups is advantageous from an animal welfare point of view. Group handling is based on gas stunning but is not very well suited to electrical stunning. Unfortunately, stunning with high concentrations of CO2 has recently been found to be aversive to pigs. Aversion to CO2. Video: Dr. Raj, University of Bristol. No aversion to argon. Video: Dr. Raj, University of Bristol. There is an urgent need for further research on stunning methods and their technical performance. There is also an urgent need for improved and continuing education of staff to ensure good animal welfare. What is the alternative to gas stunning? Will the use of other gas combinations be the future? All forms of transport are potential stressors for animals, and transport also has a negative impact on the environment, so transport time and number of stops should be kept to a minimum. One purpose of lairage is to maintain a reserve, or buffer, of pigs so that the processing line can operate at a constant rate irrespective of variations in the delivery of stock. Under optimal conditions, lairage has the added advantage of giving pigs a chance to rest and drink. Lairage situations can also be very stressful, however, and pig welfare would be improved if they were driven directly from high-quality transport conditions to stunning. What are the alternatives to overnight lairage? How do we avoid mixing of animals? How do we reduce the driving speeds and fast throughput rates? 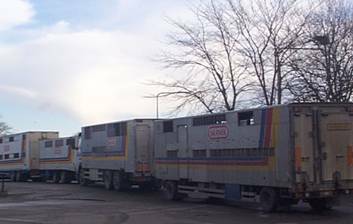 Transport vehicles queuing to unload at an abattoir with bad logistics. Photo: Anne Algers. High body temperature due to heat and exercise stress during pre-slaughter handling has detrimental effects on animal welfare and meat quality. It is common practice to keep temperatures down by spraying the pigs with cold water during lairage. Unfortunately, this causes problems with water-borne contamination of healthy pigs and handling of large amounts of sewage. How do we avoid increases in the body temperature of pigs during pre-slaughter handling? What are the alternatives to spraying with water? Sprinkler systems decrease temperature during lairage. It also has an effect on the behaviour of the pigs. Photo: Anne Algers. The repetitive nature of the job of handling large numbers of pigs, and pressures to move the animals to keep up with contracts or slaughter lines, can have the effect of desensitizing handlers to the welfare needs of the animals they are handling. Regular education of handlers, and the use of handling facilities that apply knowledge of the principles of animal behaviour, can make the handling of pigs easier. How do we avoid alienation when handling pigs at slaughter? 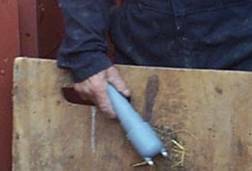 The use of electric goads to drive pigs is based on the animals' ability to feel pain. Photo: Anne Algers.